It's for your Tooth Fairy! Matthew, a bright little 1st grader with a shock of red hair and freckles to match, walked up to the circulation desk at the busiest time of day. He was clutching a baggie with my name scrawled across it--misspelled in red marker. It contained some bills and coins. Since we had just finished the book fair I figured he was bringing me money to pay for something he bought and that I had paid for. I frequently make up deficits when kids are short a little cash. I always tell them how much they owe and that they can bring it in later --- some of them remember and bring it in even if its only a few pennies. Others forget and I wind up writing a check to cover those kids. "Matthew, is that for something you got at the bookfair?" He looked surprised. "No, don't you remember my tooth?" This was not the response I was expecting. I racked my brain as I went back to our last conversation. "Oh, yes," I said. "You lost your tooth and the tooth fairy brought you $3.00." "Yea, and you said when you were little the tooth fairy only brought you a quarter." "That's right," I said, looking puzzled. "Well, this is to make up for you -- for your tooth fairy!" For a moment I sat stunned by what I was hearing. 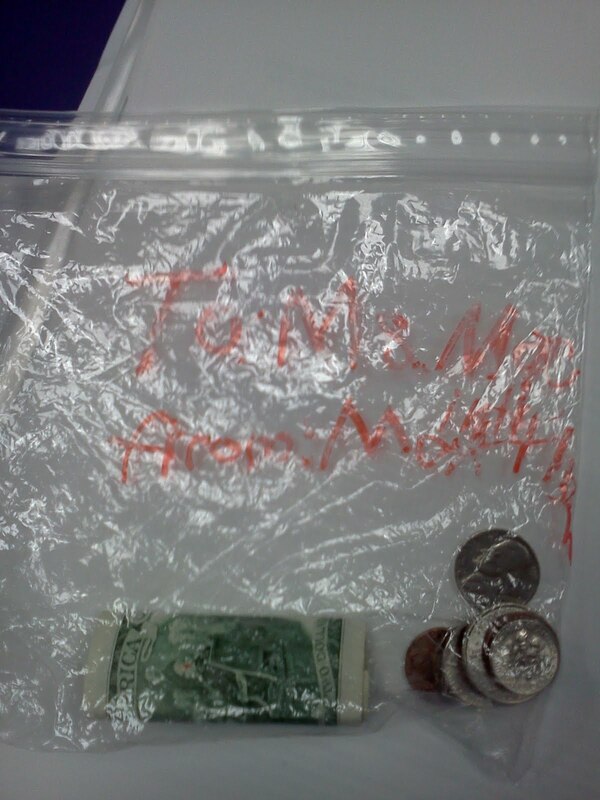 This sweet young boy felt deep empathy for me and wanted to make up for the poverty of my tooth fairy. It was a moment of priceless beauty in the midst of a hectic busy morning in an average elementary school library. Such a generous gift. My immediate response was to hand him back the envelope telling him I couldn't accept such a gift from a student, but that didn't feel right either! Such generosity had to be honored and accepted. "Why, THANK YOU. "..I stammered. You are very thoughtful, Matthew." The baggie remained in my purse until Christmas Eve. As I hurried past the Salvation Army Bell ringer I knew, exactly what to do with such a gift. I placed the contents of the baggie in the kettle.....keeping the baggie.....as a treasured memory!